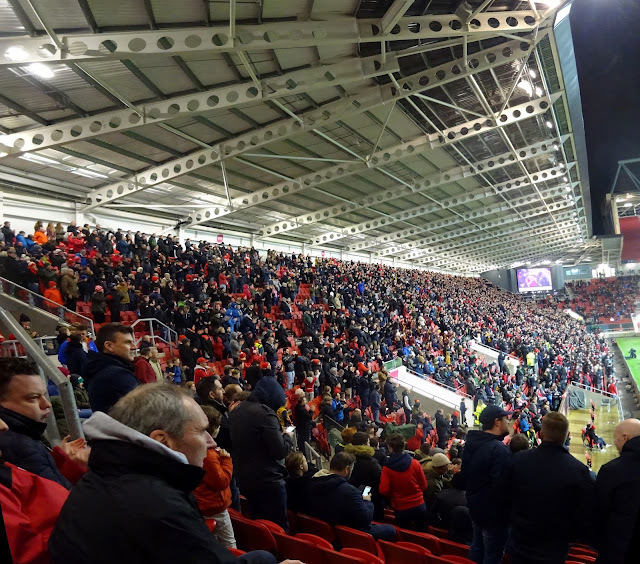 Well, I don't think too many neutrals saw this one coming: a 4-0 bashing for third place Huddersfield Town at the hands of a Bristol City side in dire danger of relegation. The more astute City fans would, of course, point to a recent upturn in form which had seen just one loss in their previous five matches........but, nevertheless. Visiting defender Mark Hudson cast a long shadow over the first period. He being the immovable object into which teammate Jonathan Hogg clattered, resulting in the latter being stretchered off after a lengthy delay. Hudson then played a key role in City's opener on the half-hour: his poor touch allowing Tammy Abrahams to steal the ball, with Hudson's subsequent attempt to atone with a pass-back simply setting up Lee TOMLIN. The earlier injury stoppage to allow treatment to Hogg, meant we were treated to some 15 minutes of stoppage time. And it was in the dying seconds of such that City doubled their lead as ABRAHAMS rather neatly turned in David Cotterill's right-wing cross. Huddersfield had enjoyed the bulk of possession during that first half I felt, but had achieved virtually little of note with it. And, although they improved a touch after the break – Nahki Wells in particular making a nuisance of himself - when home defender Aden FLINT's neat back-heel converted a scuffed attempt by Gary O'Neil, to make it 3-0, even the ever-exuberant Wells appeared to wilt. As is, for some unknown reason, often the way of things in such one-sided encounters, the referee decided, a few minutes from time, to award a decidedly soft penalty against the already demoralised visitors. Not that David COTTERILL cared, he efficiently dispatching the spot-kick past Danny Ward to complete the scoring. I wonder how many other folks in the ground noticed the ball bobble back out of the net and comically bounce slap bang onto the top of Ward's head. It just seemed the final dollop of humiliation for the Terriers. City celebrate their third........with Tammy Abrahams (is it?) deciding the ball-boy deserves a hug. 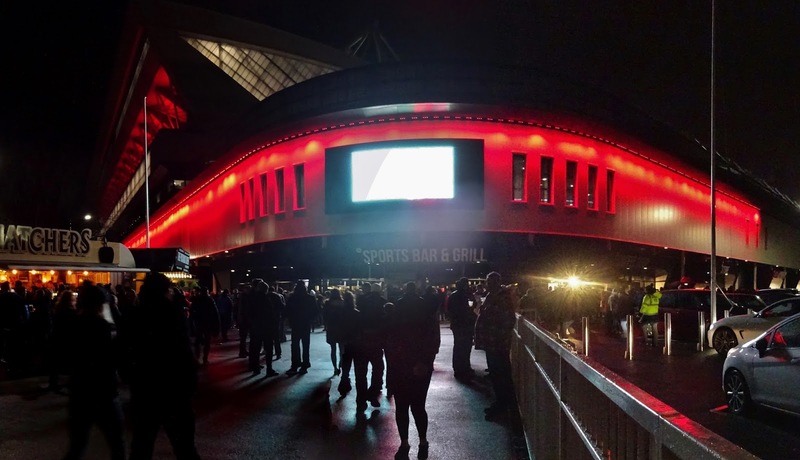 There are large screens in two corners of Ashton Gate. An impressive place indeed is Ashton Gate these days, following the completion of the West (Lansdown Stand) in 2016. A Baby Emirates, I heard someone once call it. Perhaps it is not quite there yet, but the red spongy seats with acres of leg room did put me in mind of our visit to Arsenal some years back. In a nod-of-the-head to City legend John Atyeo, I had initially asked for a ticket in the Atyeo Stand, to be told at the desk that is was Sold Out. Which initially rather impressed me, I have to say. Until getting inside I noted it was anything but. I can only assume the kindly chap at the ticket office, seeing my advancing years, thought I may prefer to be seated in a rather less fractious area of the ground – as the Ayteo Stand did appear to be where the Wild Ones resided. 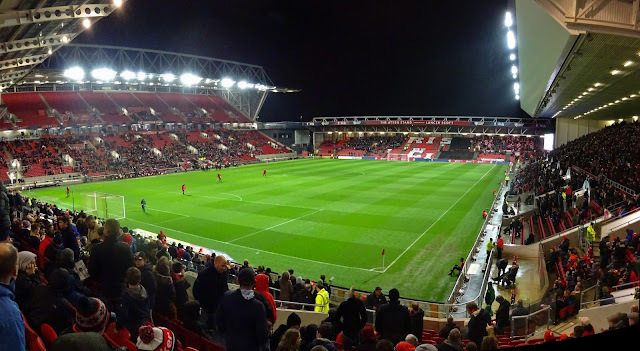 Ashton Gate - Bristol City FC. In the concourse of the South Stand is a board listing all the Club Captains of tenants Bristol Rugby Club, since 1888. I really rather liked this touch. On the final morning of our Bristol trip, I got up early and made the half-hour walk to Vale Street in the (aptly-named) Totterdown district of the city. For here can be found what has been scientifically proven to be the steepest residential street in the UK. And it certainly was precipitous, as my burning calves attested as I lugged my tubby little frame to the summit. Once there I was rewarded with fine views towards the north of the city, where Gloucestershire County Cricket Ground could be glimpsed. Looking right from the top of Vale Street, Gloucester CCC ground can be seen. Am already looking forward to a return to Bristol to visit this venue. FOOTNOTE – This note will appear at the (ahem) foot of both the Bristol City and Bristol Rovers entries, to divert any accusations of bias. I now must be around 2/3 of the way around the English League football grounds, and rarely I have come across a city full of helpful, friendly folks as Wife and I encountered during our long-weekend stay in Bristol. Bus drivers, serving staff in shops and restaurants, and vendors at both football grounds all just seemed so utterly delighted to make our acquaintance. We had one guard at Bristol Meads Rail Station earnestly request we “Go Safe”, as we hurried to catch a train, and I do not think I have been called “My Darling” so often before in my life.